I have been getting some unexpected but welcome sewing time this week. Not much, but enough to make some incremental yet gratifying progress on my fall coat. I was able to cut out the interfacing and fuse it to my sleeves on Monday as well as cut out my back stay. Last night I was able retrofit my back stay into the shell of my coat. I bet you’re wondering how you retrofit a back stay. And I bet you’re wondering how many times I can say retrofit a back stay in this post. Hahaha! I thought about it for a while and then I thought, why not ask on Pattern Review. Nancy K answered me right away. She suggested that I sew the back stay onto the seam allowances of my shell. A simple yet elegant solution to a knotty problem. So I got to work. 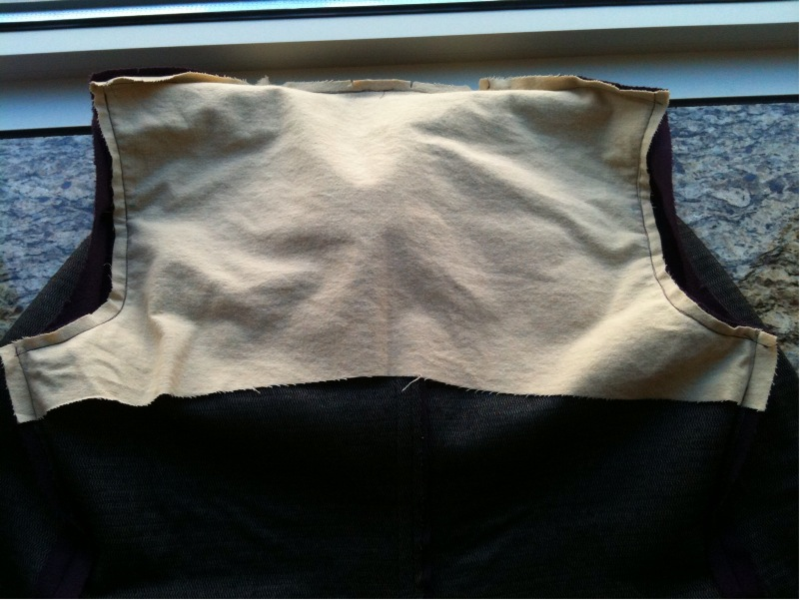 I cut out the back stay by combining the pattern pieces of the back yoke and the back, overlapping 5/8ths at the seam. I cut the stay from two inches below the armscye and used my french curve to angle up to the CB fold ever so gently. Et voilá a back stay was born! I used the cotton flannel for the stay that I was originally going to use for interlining the coat. I decided against that because I am lazy wanted a more transitional fall coat rather than a winter coat. Then I staystitched the neck and armscye of the stay and pinned it to the back of my shell. I carefully stitched the stay to the seam allowances of my shell, only once sewing it to the actual back for a few inches. Of course I spent some quality time with my seam ripper at that point. Fun times I tell you, taking out stitches from wool. Fun times indeed. That’s the stage where I remain today my friends. I will reconvene with the sewing committee (aka my Emerald 183) tonight and see where the evening takes me. I can’t wait!!!! Of course as the weather is wont to do, it will be dipping into fall temps on the morrow, so I am feeling a lot of pressure motivation to finish this coat pronto! This entry was posted in Coats, Sew Alongs, Sewing, Simplicity, Trench Along. Bookmark the permalink. Oh, I WISH this had happened two weeks ago. I totally needed to retrofit one of my jackets to put in my back stay, but didn’t know how. I think I’m going to have to do some un-sewing and fix that. Picking out stitches from wool…blech! You’re going to be SO much happier with the result, tho. Looking great so far – ugh on picking the stitches out of the wool! Did you see my new blind hemmer toy? I got it working and this baby hems like a dream. More wovens, here I come! Isn’t PR great? I had some help from there too. Glad it all worked out okay for your coat. Let me guess…you’re on a mission to make your blog the #1 search result on Google for the phrase “retrofit back stay”?